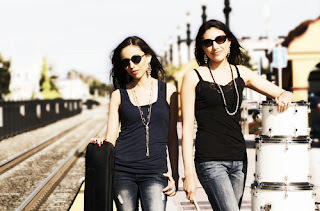 Deer Park Avenue is a pop/rock band based out of Sacramento, California, consisting of two sisters living out their dreams. Playing music from such a young age together has helped unify and solidify their songs thus far. From the instrumentals to the vocals, everything fits together so well. Their music is very catchy and it hooks you in, as any music should. When listening to “City Streets”, the first release from Deer Park Avenue, you can already tell that the chemistry and talent is there to make it big. You can see that their sound is starting to take shape as it lays a solid foundation for which to build upon. Everything that makes them Deer Park Avenue is evident in this record, from the lyrics to the vocals to the instrumentals, everything that is associated with Deer Park Avenue makes an appearance. My personal favourites from the five song EP include “Over Again”, a picture perfect pop/rock song and a staple that sets the tone for the rest of the album. “Rescue Me” is also high on the list due to the emotion expressed in the song. The lyrics to this song are also my favourite. “Stop & Go”, the second and most recent release from Deer Park Avenue is a solid follow up album. Building on the foundation of “City Streets”, the instrumentals have become more well rounded and provide more harmony for the vocals. Speaking of vocals, “Stop & Go” is just another example of Deer Park Avenue’s greatest strength. They take nothing away from their debut EP but instead add another step of depth and growth. Both of Deer Park Avenue’s albums can be found on iTunes and I highly recommend you give them a listen. Personally, I can’t wait to hear what they come up with next but without a doubt, it is sure to be a solid next step in their musical careers. Bursting with talent, Deer Park Avenue is one of those bands that will be around for a long time to come.